Reclaim this fort for the Stormcloaks. Stormcloaks and Imperials battling in Fort Greenwall. Get your orders from Galmar Stone-Fist at the Rift Stormcloak Camp. Meet the Stormcloaks south of the fort. You will only receive this quest if you chose to give The Rift to the Imperial Legion during the quest Season Unending. Go to the Rift Stormcloak Camp and talk to Galmar Stone-Fist. 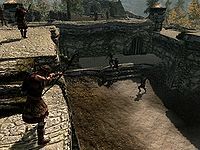 Galmar will tell you to go to Fort Greenwall and meet the Stormcloaks preparing for the attack. Meet with the men south of the fort, and then attack the fort. Your journal will keep track of the percentage of enemies left. Once all the Imperials are dead, you will have to head back to Ulfric Stormcloak for the next part in the Liberation of Skyrim quest. Bodies will usually disappear after they have been killed; this is to stop lagging. Not all the enemies are present at the start of the mission; they will spawn when enough are killed. More enemies will spawn than are needed to kill. This quest will take the place of The Battle for Fort Sungard. 10 Galmar Stone-Fist has sent me to assist in taking Fort Greenwall from the enemy. 9000 Finishes quest We have succeeded in taking Fort Greenwall from the enemy. The following empty quest stages were omitted from the table: 0, 100, 200, 300, 400, 500, 910, 920, 950, 1000, 2000, 9200, 9999. On the PC, it is possible to use the console to advance through the quest by entering setstage CWFortSiegeFort stage, where stage is the number of the stage you wish to complete. It is not possible to un-complete (i.e. go back) quest stages, but it is possible to clear all stages of the quest using resetquest CWFortSiegeFort. This page was last modified on 22 March 2019, at 05:28.